– Pass my theory test. I was hoping to pass my practical too but that is now sounding a little ambitious- gotta challenge yourself ey. Any tips or tricks, feel free to throw them this way! – Lose a stone and a half. I got my stone award this week (wheyyyyy) but I’m aiming to lose another 7lbs before my birthday on 22nd December. And then I might allow myself to binge a little over Christmas. – Save for my trip away. You might have seen me mention it on my Twitter, but in case you hadn’t heard the news, I’m heading to China in February to visit my best friend who is working over there, followed by a week travelling Thailand. I’m so excited for this! But first I must save up, which for me is much easier said than done. Although I had set up a savings account, so it’s a good start right? -Enjoy every moment of Christmas. I have had such a hectic year this year, finishing my Masters in September to flinging myself into working 6 days a week. While it’s been great I haven’t found as much time as I would love to really spend time with family, friends and my boyfriend. With a little time off over Christmas, I can’t wait to finally have that time to spend with the people I love, and I will cherish every moment of it. – Restart my job search. Earlier this year I finished my Masters in Digital Media, with the hope of developing a career in Marketing/PR. Currently I am working as a special needs teaching assistant, which is a job I enjoy doing, but truth be told it is definitely not what I aspire to be. I gave up job searching as it was slowly becoming a tiring process, that was not doing my mental well being any good, dealing with constant rejection. I decided to take a little time off, settling in my current job. Yet this month I definitely want to restart my job search, hopefully with a fresh and open mind. -And finally BLOGMAS. 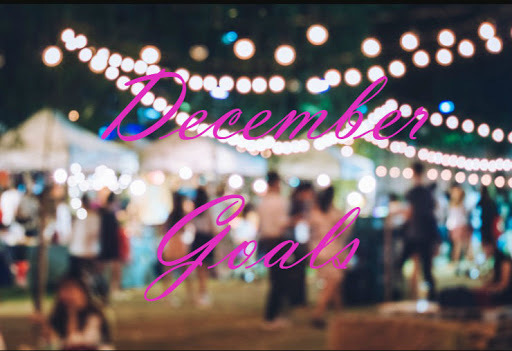 I promise to you that I will blog every single day in the month of December. I have so many ideas and creative content swirling around in my head, that I really want to spend some time getting them all down on my blog. I want to use this as my own personal project to myself but also for you as, let’s face it, I’ve been a bit crappy at blogging these past couple of months.